The keys to self-knowledge and deep contentment are right here before us in this very moment—if we can simply learn to live with open awareness. In The Unfolding Now, A. H. Almaas presents a marvelously effective practice for developing the transformative quality of presence. Through a particular method of self-observation and contemplative exploration that he calls inquiry, we learn to live in the relaxed condition of simply "being ourselves," without interference from feelings of inadequacy, drivenness toward goals, struggling to figure things out, and rejecting experiences we don't want. Almaas explores the many obstacles that keep us from being present—including defensiveness, ignorance, desire, aggression, and self-hatred—and shows us how to welcome with curiosity and compassion whatever we are experiencing. "Almaas is a genius at revealing both the core qualities of Essence and the veils that obscure it, always in language that helps peel away those veils, always holding open the door to the unfolding presence and awareness that remains when the veils have dissolved. 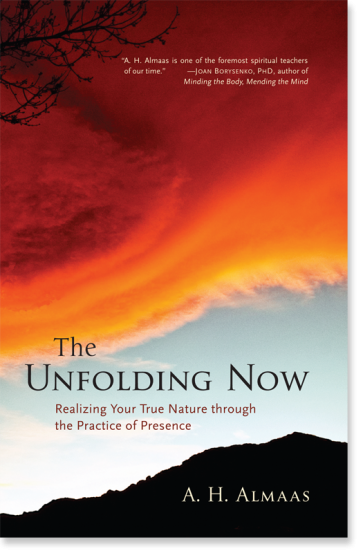 The Unfolding Now leads the reader through a masterful series of inquiry processes, invitations to sense and know ourselves at increasing levels of subtlety, gently walking us deeper and deeper into Truth." "I love the unfolding Almaas! His clarity never diminishes, yet each book brings an increasing simplicity and gentleness. As I worked with this latest material, I felt like I was receiving a transmission of pure compassion. His strong, true voice reminds us that beyond the endless self-improvement projects and idealized mystical states with which the spiritual path is strewn lies the simple but exquisite taste of our own being."